There has been no shortage of innovative culinary items at Taco Bell. There was the Black Taco, where they took a regular taco and put it inside a different color, similar tasting shell. Then there was the Volcano Taco, where they took a regular taco and put it inside a different color, similar tasting shell. Then there was the Double Decker Taco, where they took a regular taco, and put it inside two similar tasting shells. 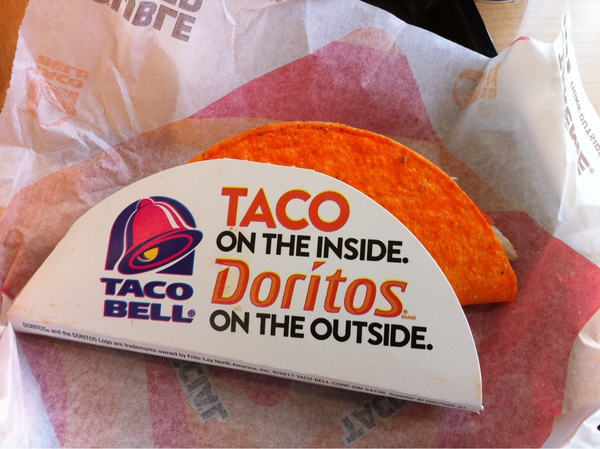 Now, they’ve launched the Doritos Loco Taco, where they’ve taken a regular taco and put it inside a regular shell covered in Doritos powder. So did this new culinary feat hit the mark? Read our review. Let’s start with aestetics. The taco comes in a protective sleeve, presumably to keep Doritos dust off of your fingers. At first glance, this appears to be good thinking on Taco Bell’s part, but when you try to take your first bite, you will find otherwise. First of all, when you scoot the taco forward to take a bite, all of the tomatoes slid off because of this sleeve. Now, for those who hate tomatoes on their tacos, like American League MVP Justin Verlander, this seems ideal. However, some of us need as much of the nutrients tomatoes have to offer as possible, like prostate-protective lycopene. We’re not all super-rich Major League Baseball pitchers who can afford new a new prostate whenever we feel like it. Secondly, you have to touch the taco anyway to move it away from the sleeve, thereby getting Dorito dust and taco debris on your fingers. It is the worst of both worlds. And finally, in what state are 50 percent of Taco Bell’s customers when they eat the restaurants food? That’s right, inebriated. A drunk person, preoccupied with the fact that they’re about to eat tacos and Doritos AT THE SAME TIME, will not realize the protective sleeve is there and will bite right into it. In conclusion, I give the Taco Bell’s new Doritos Taco 5 Stars, out of 5,000 stars. I’m looking forward to more food reviews . How about push cart ice creams ? Home Depot parking lot tamales ? Can’t. Stop. Laughing. You 1000% should add food critic to your bio. Tim is this review covering the Supreme Doritos Loco Taco as well? This IS the Supreme Doritos Loco Taco!